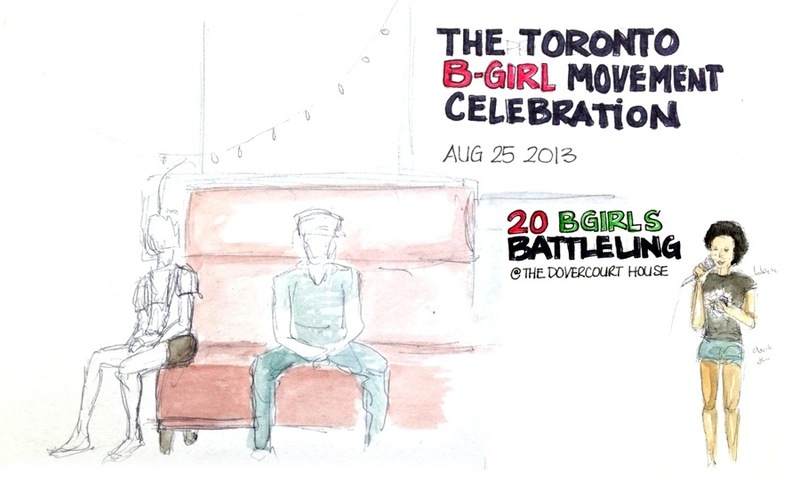 In an attempt to practice drawing people in motion, I decided bring my sketchbook to the Toronto B-Girl Movement Celebration at the Dovercourt House. It was great to see all these people of various ages, dancing and having fun. 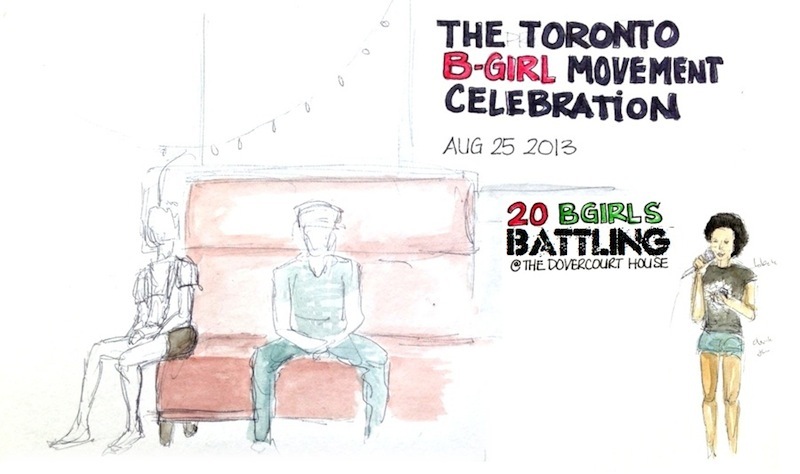 The event was to celebrate the end of the session of a three-month program created to support girls interested in learning more about breakdancing. The celebration featured 2 on 2 battles (pairing a guy and a girl to compete against another girl-guy team), cyphers (dancers taking turns expressing themselves by showing off their moves within a circle of participants), and food. Whoever organized this, did an awesome job. 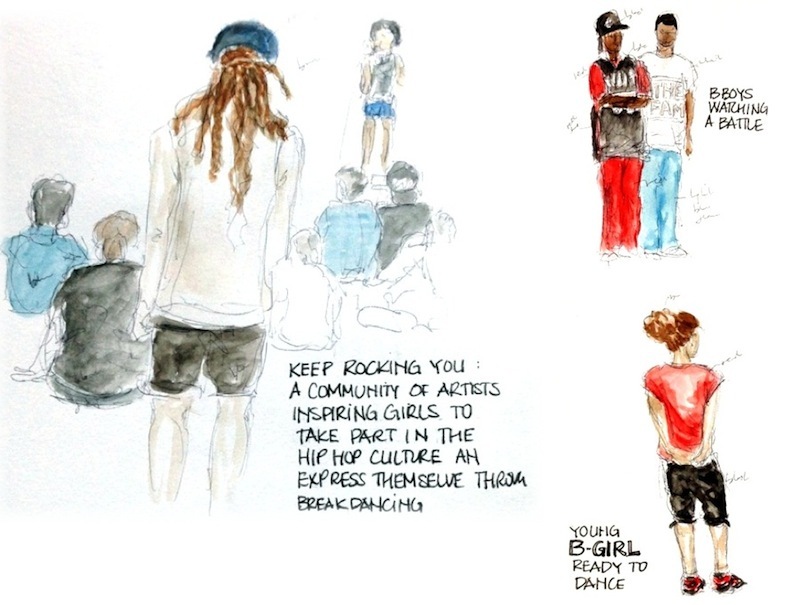 Bboys and Bgirls don't really stand still for long periods of times, especially when there's music going on, so I started by drawing people sitting down to chat, eat or take a break. During the first part of the event, most dancers were warming up, learning tricks from one another, catching up with friends. I really got a nice sense of community while I was there. People came to see my drawings, I chatted with a couple dancers and even lent my belt to a young girl who decided to participate last minute to the battle. The MC presented the girls who took part in the program and who were going to participate in the battle. 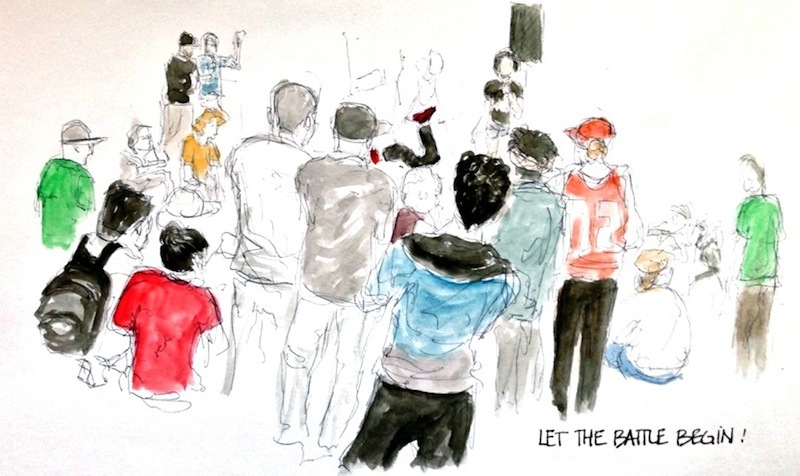 It was a great occasion for me to sketch the group of people who gathered to listen to her. Then battling teams were randomly selected and after a little strategy session between team members, the battle began. I stood on a bench in order to get a better view as more people gathered around to see what the dancers could do. It's very impressive to see what some of them can do and the creativity in their movement and choreography. I've always been fascinated by the amount of control they have over their body. And the ability to carry their weight on one hand never get's old. 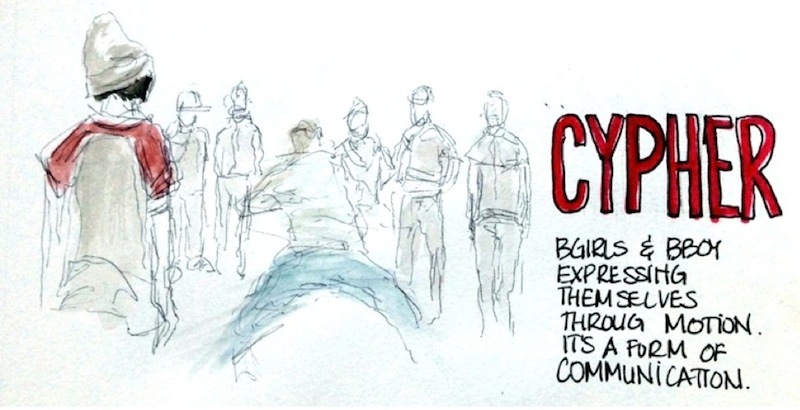 While the battle was going on one side of the room, there was also a cypher going on the other side of the room. I sketched one instance of it and I'm happy with the result, especially the movement of the dancer in the middle. I hope that with time I'll be a little faster and will be able to concentrate more on the movements and the beautiful shapes these dancers create with their body. To me they are like a dynamic, living, breathing, moving works of art : organic sculptures. I'm glad I was able to see this and would definitely do this again.